Germany is facing the biggest right-wing extremist, antisemitic and racist wave ever since its inception in 1949. Firebombs against refugee camps, verbal and physical attacks against asylum seekers and refugees have become a daily phenomenon. The unprecedented move of German chancellor Merkel to open the borders in September 2015, due to hundreds of drowned refugees in the Mediterranean Sea in 2015 alone and a huge number of refugees in Hungary and the Balkan, was courageous and an act of humanity. That was very unusual for a German. Recently, the General Secretary of the Bavarian Christian-Social Union (Christlich-Soziale Union) or CSU, Andreas Scheuer, said the following: “The worst thing is a football playing man from Senegal, serving at the altar (in a Catholic church), being an economic immigrant – we won’t ever get rid of him again”. The CSU is part of the German government, its head Horst Seehofer is known for his racist agenda and for attacking his own chancellor, from the sister-party Christian-Democratic Union (Christlich-Demokratische Union), CDU, Angela Merkel. Scheuer says that a Christian refugee from Senegal, who fled Africa due to shocking economic crisis, has no right whatsoever to become a German, praying like Catholics do and playing soccer or football. Obviously, for him human beings are not equal and have not the same rights. That is what we call racism. That has become mainstream in Germany, he is a leading figure of the CSU, who is part of the Federal Government in Germany. Of course, there are critics of that kind of racism, but he had not to resign at all. Next, the right-wing extremist “Alternative for Germany” or AfD was elected in Berlin, September 18, 2016, with 14.2% of the votes. A few weeks before they were elected in the northeastern land of Mecklenburg-Vorpommern with almost 21%. The AfD wants to prohibit shechtia, as it is written in the Federal Program of the AfD in 2016, the Berlin program also is against it, with the exception of shechtia of short-term electrical anesthesia, which still is not in accordance with most Jewish practices (and Muslim) of shechtia. The AfD Berlin wants to end all “gender studies” and claims, “Islam is not part of Germany”. According to a report by journalists Karin Janker and Oliver Das Gupta in the leading German daily Sueddeutsche Zeitung (SZ), the Berlin AfD is mainly a male party with many far right activists. For example, head of the Berlin AfD is a former officer of the German army who worked for NATO, Georg Pazderski, he wants to “muck out” the democratic elected Parliament in Berlin, which he frames as “Augean Stables”. We know similar wording from the Nazi agitation period in the 1920s, prior to 1933 when Hitler became chancellor. They claim that democrats were unable to rule the country or city. They delegitimize democracy. Another new member of the Berlin Parliament will be Thorsten Weiß, an ally of AfD leader Björn Höcke, who is known for his Goebbels like agitation. Weiß uses similar wording like “the political cast that is against the will of the people”. Co-Head of the AfD, Frauke Petry, went so far and urges Germany to use the antisemitic word “völkisch” – volkish – again, without any hesitation. After Auschwitz, völkisch stands for the affirmation of the antisemitic German society, of Nazi Germany, no less than that. In former times, that would have been a huge scandal in Germany. Not so today. The media is rather eager to discuss it, and to promote those who defame Merkel, that is crucial. Another MP in Berlin will be Ronald Gläser from the AfD, he asks, “what would have happened if England had not declared war on Germany in 1939?”, as the Sueddeutsche documents – this kind of historical revisionism, the denial of the German guilt of the outbreak of World War II is an essential component of right-wing extremist propaganda ever since 1945. Gläser seems to be loving insinuations and promotes himself as an ally of former antisemitic politician of the German Liberal Party (liberal seen as rather libertarian, not left-wing), the FDP, and their agitator Jürgen W. Möllemann, who was infamous for his agitation against Israel and Ariel Sharon and Israel in 2002. Möllemann, who was a leading politician of the FDP at the time, then killed himself. The core message of the racist movement in Germany these days goes like this: The AfD wants to “get rid of Merkel”. 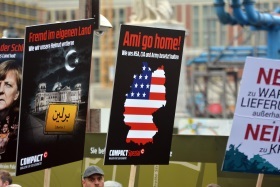 That was the slogan of their big rally in the heart of Berlin, Nov. 7, 2015, with neo-Nazis joining them, including agitators against America who say that “Germany is run by NSA” and the US, as right-wing extremist and antisemitic agitator Jürgen Elsässer’s Compact Magazine did on that day. Elsässer is also known for public speeches like at Potsdamer Place in the middle of Berlin, like in April 2014, where he agitated against “Rockefeller, Rothschild, Soros”, Jews and money. The AfD shares their anti-Merkel slogan with many in Germany, not only neo-Nazis, even Jewish journalists like well-known Henryk M. Broder. He distinguishes, like many on the far right, between the “publicized opinion” and the “public opinion”, as he said in a video interview. Read: the ordinary German people knows much better how to act than elected politicians, the mainstream media, let alone intellectuals or antifascist activists. This is a widespread right-wing extremist trope. Broder is even part of a nasty campaign against a leading pro-Israel foundation in Germany, the Amadeu Antonio Foundation (AAS), headed by Jewish Anetta Kahane. The AAS is accused for censorship on Facebook and the Internet, a baseless claim, taken the fact that Facebook has many advisors, including of course the AAS or the German government and many others, when it comes to hate speech. The Global Forum for Combating Antisemitism, organized by the Israeli Foreign Ministry, is of course aware of the threat deriving of hate speech, antisemitism, Islamism and neo-Nazism on Facebook and other social media. Andre Oboler from Australia is a leading participant of that Global Forum and head of the Online Hate Prevention Institute. He should teach Germans about this. Broder and his platform and Blog “Achgut” (“Axis of the Good”) could learn a lot from him, the same holds for the publisher of the monthly Jüdische Rundschau, Rafael Korenzecher from Berlin, who joined the campaign against the Amadeu Antonio Foundation. Amadeu Antonio Kiowa from Angola was one of the first victims of German racism and neo-Nazism after the German reunification on October 3, 1990. He was attacked by neo-Nazis late on November 25, and died December 6, 1990, due to the attack. The Foundation named after him is doing work against racism, nationalism, including the Alternative for Germany (AfD). They also do a lot of work against antisemitism, and hatred of Israel. Neo-Nazis of the “Identitarian Movement” or “Bloc Identitaire”, as they are called in France (in German Identitäre Bewegung), attacked the Foundation several times. Their anti-antifascist efforts are even joined – in effect – by a Member of the Federal Parliament, the Bundestag, Thomas Feist from the conservative Christian Democratic Union. Feist was a former head of the German-Israel Friendship Society in Leipzig and now urges the German government to stop supporting the AAS Foundation financially. All these agitators against the Amadeu Antonio Foundation can’t stand that a rather left-of-center institution does work against neo-Nazis and is also anti-Islamist and pro-Israel. Many pro-Israel activists in Germany are silent about their extreme right-wing allies. They are most often unable and unwilling to even discuss critically troubling policies of Netanyahu and his right-wing government. They should listen to Amos Oz, for example, a true Zionist. Most Germans in the so-called pro-Israel camp ignore the Zionist camp in Israel and have no interest at all in discussing mistakes of the Netanyahu government in recent years. This kind of ignorance will destroy the Israel solidarity movement in all of Europe, as many people simply do not take them seriously anymore. The AfD, as their chapter in Cologne tweeted, was happy about the attacks of a Jewish paper like the Jüdische Rundschau against the Amadeu Antonio Foundation. Extreme right-wing Jews against a pro-Israel foundation. Give me a break! The Nazi-like agitation by Björn Höcke from the AfD, the use of THE antisemitic word of Nazi-Germany, völkisch, by head of the AfD, Frauke Petry, or the “idea” to use weapons to stop refugees entering Germany by Beatrix von Storch from the Berlin chapter of the AfD all indicate the right-wing extremist climate in that party. They are the Parliamentarian wing of the neo-Nazi like German Pegida movement in Dresden and elsewhere. If you think in Israel that the German press is against the AfD, forget about that. Many TV stations are extremely eager to get the nastiest AfD politicians on stage, some like the mainstream Berlin daily Tagesspiegel argue in favor of the party, and against any true criticism. The use of the antisemitic word völkisch by Petry does not irritate the German public at all, besides a few reflecting people, of course. Many in the pro-Israel camp in Germany reject any differentiation between Islam and Islamism. Broder is a case in point. He makes fun of all who make that differentiation. On the contrary, serious authors insist on that crucial distinction. Many in Israel, the UK or the US do not understand the nasty climate in the anti-Islam (which is not an anti-Islamism camp alone!) and pro-Israel camps in countries such as Germany. If you want to have a serious fight against jihad, Islamism and for Zionism and Israel, you have to fight the far right and the Alternative for Germany (AfD), who’s head Frauke Petry is promoting the word völkisch and therefore, hidden behind the hands, affirms the Holocaust and National Socialism. With a smile, of course. They are not Holocaust deniers. They rather love consequences of völkisch policies…They want a völkisch Germany, again. This is no hint to the German Kaiserreich or the Weimar Republic, as some historians and journalists mistakenly claim. Völkisch stands for Nazi Germany and Auschwitz. For all times. Germany is stuck between brown (Nazi like) and green (jihadist like) fascism. Brown fascism is likely to win that battle and even the war itself. The next big battle they want to win is the resignation of Merkel in 2017 and they are likely to win that battle. Racism, nationalism and antisemitism are on the rise in Germany. I would never ever have thought that Angela Merkel would be in the way of ugly German ideology, including racism, nationalism and antisemitism. For one year, between September 2015 and September 2016, she has been a lighthouse of dignity and humanity in a country and continent full of hatred, from Hungary to the extreme right-wing “Sweden Democrats”, to Poland, UK’s Brexit, Austria’s FPÖ’s presidential candidate Norbert Hofer, who can be called a “Nazi” according to a court ruling, to Germany and back. Due to unbelievable nasty attacks against Merkel, including attacks from other conservatives in her own party or sister party like Seehofer, she might resign at the party convention of the CDU in December this year. If not, her new policies will become similar racist than those offered by agitators like Seehofer, Scheuer or the AfD and the neo-Nazi like Pegida movement. Merkel knows that jihadists are mostly homegrown and a serious threat and Syrian refugees are victims of both Assad (Iran, and Russia), Islamism, ISIS and all kinds of jihad. The most dangerous jihadists are those who go to war and arm themselves. Among the several hundred German jihadists who went to Syria and ISIS there are no refugees at all, as the Federal Office for the Protection of the Constitution (Bundesamt für Verfassungsschutz) in alliance with two other state institutions, has analyzed in a groundbreaking study. They analyzed all German jihadist, their social structure and ideology. No such study exists in any other European country, including France or Belgium, who became horrible victims of jihad, taking the years 2015/2016 alone. If you want to prevent future jihadist attacks, you need secret services and police – stop of immigration has close to nothing to do with that! Racism against refugees is part of the problem, not part of the solution! The problem is jihad, not Islam, without ever ignoring that jihad and Islam share of course some and not few common aspects. But they are never identical, that is crucial to finally understand. Many Jews could have been saved from Nazi Germany if the US or the UK in Palestine would have had open doors. Without ever equating genocidal antisemitism to racism, we have to see that open doors for people who have nothing to lose – who left their homes, their families, their beloved neighborhoods, their climates, skies, smells, waterfalls or deserts, bookshelves, flowers, trees, animals or furniture, paintings and art behind – is an essential part of what we call humanity. Germany, again. 2016. A country that is not running riot about a politician, Frauke Petry, co-head of the Alternative for Germany (AfD), who wants to reintroduce the word völkisch to German language – intentionally after Auschwitz and Babi Yar, Sobibor and Treblinka. 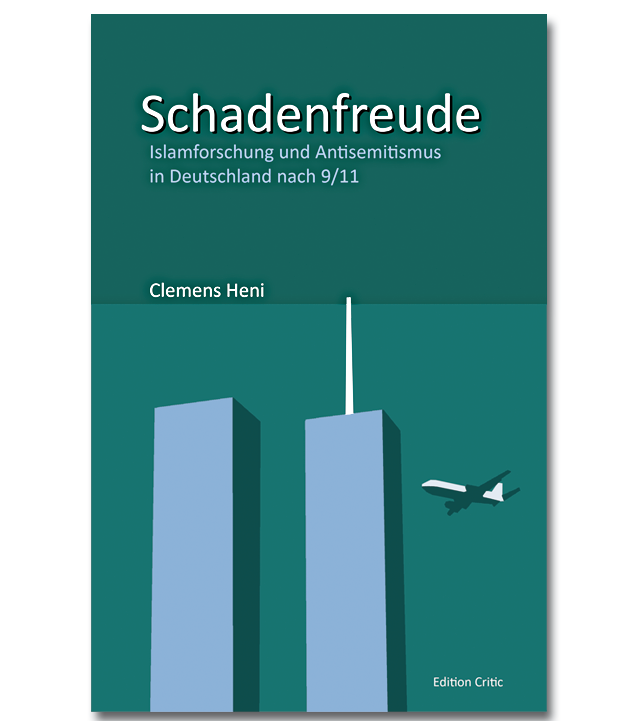 The author, Dr. Clemens Heni, is Director of the Berlin International Center for the Study of Antisemitism (BICSA). He was a Felix Posen Fellow at the Vidal Sassoon International Center for the Study of Antisemitism, Hebrew University of Jerusalem. Like Hillary Clinton he liked to go to Clark’s Dairy in New Haven, a fantastic old-school American restaurant, just a minute from his home during his time as a Post-Doc at Yale University. Bezeichnend ist das Mitmachen bei der Hetze gegen eine demokratisch gewählte Regierung durch Publizisten wie Henryk M. Broder von Achgut oder Rafael Korenzecher von der Jüdischen Rundschau, die beide die Agitation gegen “Wir schaffen das” und gegen den Islam mitmachen. Der Wahlerfolg für die Rechtsextremen der AfD vom 4. September 2016 ist schockierend. Vor allem an der Ostseeküste, Greifswalder Gegend vorneweg plus Rügen, haben die extremen Rechten, Rechtspopulisten, besorgten Bürger und Nazis teils um die 35% der Stimmen und mehr, wenn man dann noch die NPD dazu nimmt, die dort auch auf über 5% der Zweitstimmen kommt. Flüchtlinge spielen in diesem Bundesland so gut wie keine Rolle. 2015 kamen 23.000 Flüchtlinge nach MeckPomm, davon sind ca. 1/3 geblieben. So wenig wie der Antisemit Juden benötigt, so wenig braucht der Rassist sein Objekt der Begierde zu sehen etc. – es findet im Kopf statt, ohne hier den Verschwörungswahnsinn des Antisemitismus und die Vernichtungsabsicht gegenüber Juden oder Israel auf den Rassismus zu übertragen oder gleichzusetzen. Das Bundesland Mecklenburg-Vorpommern stirbt eh aus, seit 1990 hat es 300.000 BewohnerInnen verloren und hat jetzt 1,6 Mio. Dass die Menschen dort gar kein Interesse am Überleben haben, zeigt sich daran, dass sie die wenigen Flüchtlinge, die dort ankamen, auch noch weghaben wollen und AfD wählen. Der Rassismus in Mecklenburg-Vorpommern ist also extrem und beweist, dass Rassisten keine sichtbaren Flüchtlinge brauchen für ihren Hass und ihr völkisches Deutschtum. Dass mittlerweile massive Teile der Bevölkerung, zwischen 15% (BaWü) und ca. 25 % in MeckPomm (AfD plus NPD) bzw. Sachsen-Anhalt rassistisch und deutschnational wählen, zeigt an, dass dieses Land ein enormes Problem mit der Bevölkerung hat. Die Medien spielen eine entscheidende Rolle hierbei. Ohne die Auftritte bei Jauch, Maischberger oder Soft&Blöd wäre die Partei nicht da, wo sie jetzt ist, das wäre eine eigene medienpolitische Studie wert. Nicht nur der Springer-Konzern beschäftigt (nicht nur einen, wie zu vermuten ist) Publizisten, die seit Jahren der Neuen Rechten Nahrung bieten und von der “öffentlichen”=guten, AfD-nahen und der “veröffentlichten”=bösen, nicht-nazistischen Meinung daher schwadronieren. Auch die SPD muss gar nicht drum herum reden, sie selbst ist mit verantwortlich für die Hetze gegen Merkel, Erwin Sellering z.B., der alte und neue oberste Seemann im nordöstlichsten Bundesland, der Merkel mit verantwortlich machte für den Aufstieg der AfD. Den Aufstieg der AfD verdankt die Partei dem Rassismus und Deutschtum, dem Antisemitismus und der Erinnerungsabwehr an Auschwitz durch weite Teile der Bevölkerung und der Medien. Ein obsessiver Hass auf Political Correctness, auf Gender, Homosexualität, alles irgendwie Linke oder so Kategorisierte, auf ökologisch Sensible wie gewerkschaftlich Organisierte wie auch die Sehnsucht nach einem Schießbefehl (nicht nur) an der Grenze ist typisch für die „besorgten Bürger“, wie Rechtsextreme heute bevorzugt genannt werden. Es geht ihnen um kollektive deutsche Identität, die das Fehlen einer Ich-Identität zu kompensieren verspricht, wie die Sozialpsychologie analysieren würde. In einer Demokratie muss es dazu gehören, Teile der Bevölkerung zu beschimpfen und sie als “Pack” zu bezeichnen und sie nicht als Wähler “zurück” zu gewinnen. Die Menschen können sich ändern – oder auch nicht. Wir haben Aktionen erlebt, wo ganz normale Deutsche Flüchtlinge als „Dreck“ bezeichnet haben. Das führte Sigmar Gabriel seinerzeit dazu, von diesen Menschen ganz gezielt von „Pack“ zu reden. Wer in einem Bundesland, das so gut wie keine Flüchtlinge je gesehen hat, diese zu DEM Thema macht, ist wahnsinnig und obsessiv rassistisch. Das trifft auf weite Teile der Ex-DDR zu, Sachsen vorneweg als bevölkerungsreichstes Ossi-Land. Und wer angesichts von Familien oder Alleinstehenden, die dem Horror Syriens entkommen sind, gegen diese Menschen hetzt und sie als “Dreck” diffamiert – hat selbst jede Menschlichkeit verloren. Der autoritäre Charakter Vieler in der Ex-DDR kommt auch von der DDR Sozialisation her, aber nicht nur. Doch jetzt wird es interessant: in einem extrem rechten, konservativen, schwarzrotgold illustrierten Sammelband mit dem Titel „Das Volk ohne Staat. Von der Babylonischen Gefangenschaft der Deutschen“ aus dem Jahr 1981 wird das deutsche Moment der SED und der DDR hochgehalten. 1984 schrieb DER Vordenker der Neuen Rechten in der Bundesrepublik, Henning Eichberg, mal wieder über die DDR. Eichberg erkannte nach seinen Versuchen u. a. die Grünen, die Republikaner und auch die SPD für das neu-rechte Projekt zu begeistern in den 1990er Jahren in der deutschen politischen Landschaft eine neue und weitere Möglichkeit für ›nationale‹ Politik: die PDS. Als Nachfolgepartei der Sozialistischen Einheitspartei Deutschlands (SED) bot sie sich durchaus an. Soviel zum deutschnationalen Potential in der DDR, das seit 1990 in einem Maße losschlug, wie es selbst die Neue Rechte kaum für möglich gehalten hat. Solange die demokratische politische Klasse es jedoch nicht lernt, Menschen mit Inhalten zu konfrontieren und nicht auf sie als mögliche Wähler zu schielen, so lange wird der Aufstieg der Nazis sich fortsetzen, nächstes Mal in Berlin. Man muss diese WählerInnen der AfD verachten dürfen, wie es der Publizist Christoph Giesa tut. Wenn es eine einzige Politikerin in Europa und der westlichen Welt gab in den letzten 12 Monaten, die Anstand bewiesen hat und menschliche Wärme wie Weitsicht, war es Angela Merkel. Das ist gar keine Apologie aller ihrer Politiken wie dem elenden Iran-Deal, der unerträglichen Austeritätspolitik, ihrer Erdogan-Politik und vielem anderen mehr. Sie ist eine Konservative und das ist keine fortschrittliche Perspektive im 21. Jahrhundert. Aber eben um Welten harmloser als der Neo-Nazismus und Rechtsextremismus, wie wir ihn heute wieder in Parlamenten und auf den Straßen wie in Dresden (Pegida) erleben. Also: Der Hass, der Merkel von Rechtsextremen in Frankreich (Front National) über Faschisten, Rechtspopulisten, autoritären, völkischen, vom Ressentiment getriebenen PolitikerInnen in Holland (Wilders), Ungarn (Orbán), Österreich (Hofer, FPÖ) und Deutschland (AfD, NPD, Sahra Wagenknechts Linkspartei) und vielen Publizisten weit in der sog. bürgerlichen Mitte entgegenschlägt, ist unfassbar und zeigt an: die Neue Rechte strebt zur Macht. Und noch nie musste eine Kanzlerin oder ein Kanzler so stark gegen so widerwärtige Kräfte bestehen, denn dazu kommt ja noch die bayerische AfD-Light, die CSU. Dabei will die AfD primär zerstören, die Demokratie zerstören um den Weg für eine Führerin (LePen) oder einen Führer (Höcke, Gauland, Hofer, Wilders etc.) freizuschießen. Wer meint, WählerInnen von Nazis, die mit Aufmärschen der SA durchs Brandenburger Tor kokettieren und sie nachmachen (AfD, flankiert von den Neonazis der Identitären Bewegung) als “Protestwähler” klein zu reden, hat gar nicht kapiert, was die neu-rechte Stunden geschlagen. Man muss das Pack angreifen und als solches benennen und das „demokratische Versagen“ klar auf den Punkt bringen, wie es Charlotte Knobloch tut. Und man muss kein CDU-Fan sein um den Slogan “Merkel wird bleiben oder dieses Land wird untergehen” als geradezu emanzipatorischen Schlachtruf unserer Zeit zu erkennen. Und das wird kein fortschrittliches Ende sein, sondern ein rechtsextremes Fanal – auch für Europa. Merkel steht dabei gleichsam als Begriff (und nicht nur als bürgerlicher Name) für antirassistisches, menschliches Handeln angesichts unfassbar brutaler Kriege unweit der Grenzen Europas in Syrien und dem Irak, aber auch der jihadistischen Gefahr in anderen Ländern wie Afghanistan, Pakistan und vielen weiteren Kriegen und lebensbedrohlichen Lebensumständen in vielen Ländern Afrikas. Das nationale Denken in der DDR ist ein massives Problem und rührt auch von der Ideologie der SED her, wie schon vor 30 und 40 Jahren die rechtsextreme Neue Rechte in der Bundesrepublik erkannte und sich ein deutschnationales Potential in der DDR mit Strahlkraft in die BRD erhoffte. Jetzt ist es in vollem Wichs da. Wie jetzt zum Beispiel Roland Nelles, Politik-Ressortleiter bei Spiegel Online in einem Video-Beitrag sagt, sind die Wähler der AfD sehr wohl als “Rassisten” zu bezeichnen. Diese scharfe Kritik ist es, die in diesem Land viel zu lange gefehlt hat.